Maria has written articles for both the academic and consumer press. Through her blog and newsletter, she will keep you updated with the latest in nutritional news and advice. Through her blog and newsletter, Maria will keep you updated with the latest in nutritional news and advice. Many clinical conditions, such as IBS, hypertension and allergies, can be be better managed through improvements in diet and lifestyle. With 20 years worth of experience as a dietitian in the NHS and academic sector, Maria can support you and help you to regain control. Many clinical conditions, such as IBS, hypertension and allergie, can be be better managed through improvements in diet and lifestyle. Surely that’s all there is to it… right? Sessions also held at Inverurie and Turriff on request. Start living the life you were meant to live. Obesity, a poor diet and ill health affect so many of us and it’s so easy to find excuses not to tackle the problem. Imagine though, the feeling of pure joy that comes from feeling and looking fit and healthy; from waking in the morning full of energy and vitality. There’s nothing like it! 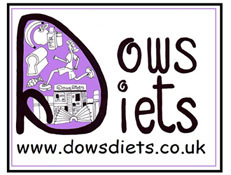 Whether your goal is to have the energy to keep up with your kids or grandkids, to run a marathon or simply to button up your jeans without cutting off your circulation, Dows Diets can help. Come on in and experience it for yourself – it’s easier than you think. Maria is licenced to deliver 2 clinically effective weight loss programmes. of experience of supporting clients to help you regain control. Having recently gained her diploma in freelance journalism she is keen to develop this area to ensure articles published in the media are interesting, topical and based on scientific evidence. Irritable Bowel Syndrome (IBS) is a functional disorder, characterised by disturbances in the normal function of the bowel. It is not.. Nutrition and Hydration week celebrates the importance of both good nutrition and hydration for good health, and also recovery when unwell.. There is a plethora of information out there given by diet and nutrition experts about what to eat for whatever..